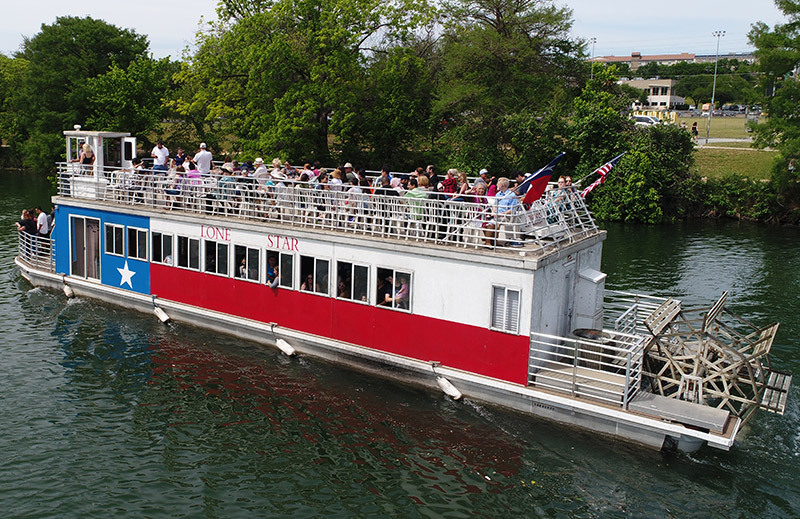 Imagine your social occasion on a delightful cruise right through the heart of downtown Austin, Texas aboard The Lone Star. Private charters are available year-round for groups of 30 to 120 people. Thrill your guests and schedule your charter to see Austin's famous Mexican free-tailed bats depart at sunset (March - October)! All events become special when celebrated aboard The Lone Star! Please note that a 15% gratuity and 8.25% sales tax will be added to the prices below. Use this link to print our private charter agreement. Charges are for the number of people guaranteed or on a per person basis, whichever is greater. Listed are a few favorites, but custom menus can be arranged. All meals on-board The Lone Star are served buffet style. We ask for menu selection at least two weeks in advance and a final attendance guarantee two days prior to your charter. There is a 30 person minimum required for catering. Vegaterian options available. Catering charges are for the number of persons guaranteed or on a per person basis, whichever is greater. State sales tax of 8.25% plus 15% gratutitywill also be added to the menu choice. There could be additional fees depending upon the service and amount of additional time needed. Any outside catering service is subject to approval by Lone Star Riverboat management and will have to provide a certificate of insurance. Menus come with heavy divided chinet paper plates, plastic ware, napkins and cups. Everything you need! In order for you to furnish your own catering, there will be a $100 fee. Please note that a 15% gratuity and 8.25% sales tax will be added to the prices below for Appetizers, Bar Service and Dinner menus. Appetizer menus are $15.00 per person. There is a 30 person minimum. Add iced tea or lemonade for $2.00 per person. Margarita Machines are not allowed unless you provide a generator or batteries to power the machine. We can provide a cash or open/hosted non-alcoholic bar. No set-up fee or minimum. We offer soft drinks, juices, bottled water and mixers. You bring any liquor, wine and or beer(No glass beer bottles). We will provide ice chest, ice, cups, limes, unlimited soft drinks, juices, bottled water, mixers and a TABC Certified Bartender to serve your drinks to your group. This service is $5.00 per person for a 2 hour cruise. You bring EVERYTHING: any beverages, ice chests, ice, cups, mixers, limes, bottle and wine openers, etc. No glass beer bottles. Aluminum cans only PLEASE. No charge for a self-serve bar area for your guests. You can hire an outside bar service to set-up a cash or open/hosted bar on our boat for your group. The service must supply us with a copy of liability insurance and use TABC Certified bartenders. We can provide a list of approved bar service vendors if you need help with this service. $50 carry-on fee. FajitasSmoked Chicken and Beef. Served with borracho beans, Mexican rice, pico de gallo, cheddar cheese, sour cream, salsa, tortilla chips, and iced tea. Smoked Chicken BreastServed with roasted red potatoes and a tossed green salad (Ranch or vinaigrette dressing), rolls, butter, and iced tea. These are items you may want to add to the menu you have already selected or services that may make your charter more complete.